Renting one or more VanDutch smooth, limousine boats makes all the difference! Contact us to organize your transfers, water limousine hire, your promotional activities and personalize your VanDutch during festivals and events on the Côte d’Azur. Promote your product or brand with VanDutch: Looking for an unusual way to promote your brand or your company? When organizing a product launch on the French Riviera or elsewhere, rent a VanDutch limousine tender! For example, in 2012, a prestigious Cannes company rented VanDutch boats to promote its new business. 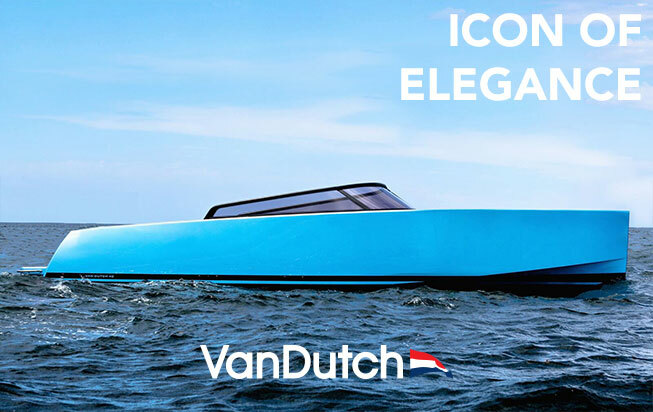 VanDutch Boats cruised around yachts moored in the bay of Cannes and the Lerins Islands and also displayed the brand along the private beaches of Croisette in Cannes. On the occasion of each Formula 1 Grand Prix of Monaco, several VanDutch boats are used by RedBull to transfer drivers from their hotels to the heart of Monaco right up to the RedBull stand in the centre of Port Hercule in Monaco. VanDutch boats are also there to take care of transferring all the RedBull team and their guests. VanDutch boats can be rented for your photo shoot during festivals and events throughout the year. For example, during the Festival de la Plaisance de Cannes 2012, a photo shoot was held aboard a VanDutch for a top leather goods company, Jack Russell Malletier. A VanDutch boat was also available for the Petrossian company, to transfer their customers up to their stand right at the centre of the boat show in the Old Port of Cannes. We displayed the Petrossian logo on the VanDutch hull. Guaranteed publicity! Festivals on the French Riviera with VanDutch: For the Cannes Film Festival and festivals on the Côte d’Azur, production companies and large magazines rent VanDutch boats to transfer their guests and clients to events and festivals. Transfers are organized from the ports of Cannes, Monaco, Antibes or from private jetties of the Majestic, the Carlton, the Martinez and other hotels on the Côte d’Azur. Boats are rented quickly for this event, so we recommend that you prepare for your 2013 Cannes Film Festival trip today to avoid disappointment. Yacht and Boat Shows with VanDutch: During the Yacht and Boat Shows of Cannes, Festival de la Plaisance de Cannes, Monaco or Antibes, rent a VanDutch to take your customers to the yachts moored off the port of Cannes, Antibes or Monaco for visits or to private jetties of their hotels, the Eden Roc, Majestic, Carlton and Martinez pontoons, Monte-Carlo Bay or even Monte-Carlo Beach. For several years now, not only are several of our VanDutch boats rented by large nautical companies, but also by other brands seeking to distinguish themselves during the Monaco Yacht Show. We can also customize your VanDutch boat with your logo during these events.